Let’s hear it for the boys! With an emphasis on cohesiveness, function, and personal value, men tend to decorate their spaces with purpose and clear direction. Though far from perfect—let’s be real here, we’ve all seen a pretty pitiful bachelor pad or two—guys do have some decorating methods worthy of any stylish space. Read on to see how men do it right, and how to apply their ways into your own home. Less is often more when it comes to masculine abodes. With homes devoid of clutter, crowded tabletops, and messy bookshelves, guys know what is important enough for display and what is simply extraneous “stuff” that doesn’t add any value to a design. Give your accessorized areas a once-over to make sure everything displayed is visually adding something significant to your home. Though we love an unexpected combination of colors and prints, when it comes to pattern mixing, men always know when to rein it in to prevent visual chaos. If you like the look of multiple patterns, stick to classic styles like stripes, plaids, and geometric shapes to ensure harmony. If you want to pile on more pattern, stick to prints in similar colors to help keep things cohesive. Men tend to only display paintings, photos, and sculpture that they find meaningful and personal. Rather than hanging art simply to take up space, each item adds value and personality to a home’s walls. 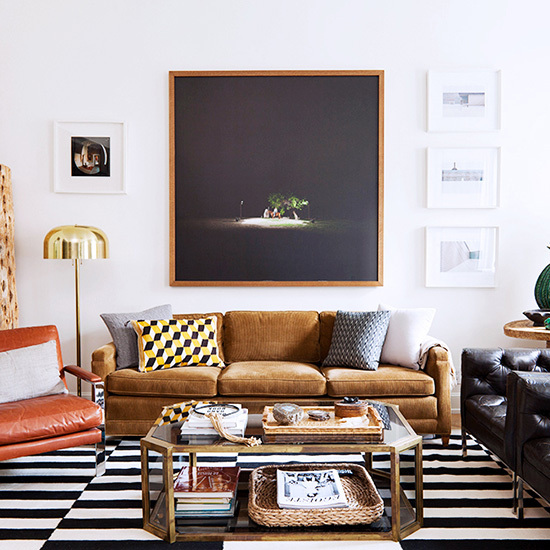 Rather than purchasing pieces just to complete your epic gallery wall, take your time when looking for art and only add items that truly speak to your tastes and aesthetic. Sticking to mainly neutral palettes featuring a variety of shades of gray, brown, blue, and green, masculine homes almost never display questionable color combinations. Though a jolt of accent color can be fun, for your home’s large items and paint schemes, opt for a restrained palette to guarantee cohesiveness. In a man’s home, if a piece of furniture or lighting is not functional or useful, it’s not coming inside. Guys know that if you want a coffee table you can put your feet on, a fragile vintage glass-top option may not cut it, no matter how beautiful. Though it can be hard to pass on an item you love, if it’s not going to function for your day-to-day needs, it’s probably time to look elsewhere. For the rest of the decorating mistakes men never make, go to Domainehome.com.